Tag Archive | "2018 AFC East Preview"
I think the fall is coming soon for this empire, and honestly, if the division was better, it probably would happen this season. Until then the Patriots will be on top. Obviously the rift between Tom Brady and Bill Belichick is at its all time high (how else would you explain the benching of Malcolm Butler in the Super Bowl?). Julian Edelman is suspended four games for PEDs, and Rob Gronkowski is playing another year and has taken many hits over his career. Oh, and Nate Solder is gone from the offensive line. With the defense, they are solid in the secondary with Stephon Gilmore at corner and Patrick Chung at safety, but not spectacular everywhere else. Matt Patricia is now the head coach in Detroit, so the defense has its question marks as well. 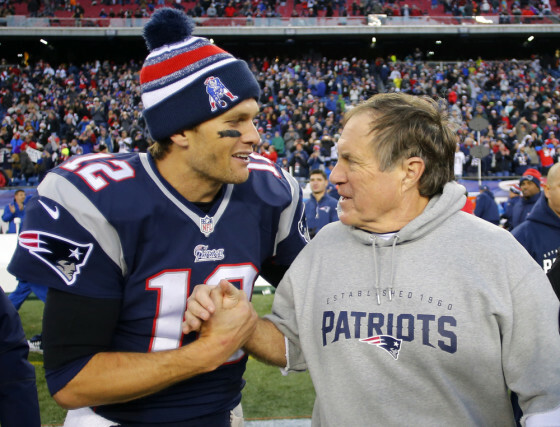 Tom Brady is still spectacular and he will have a tremendous burden put on him this year. I just don’t think any of the other teams in this division are ready to dethrone New England … yet. A lot of these Jet predictions are predicated on whether or not rookie Sam Darnold or Teddy Bridgewater get the chance to start the season. While I acknowledge future complications that may arise from having Bridgewater on this team with highly touted Darnold waiting in the wings, I’d worry about that in the future if I’m the Jets. Bridgewater has looked good and gives the Jets the best opportunity to win now. The offensive line is solid but not spectacular, and the same goes for the offensive skill positions. I think the wide receivers are a bit underrated, and Terrelle Pryor could have a bounce back year (see Washington’s offensive line issues last season). Isaiah Crowell is also a solid contributor in the running game. Bridgewater is much more seasoned than the rookie Darnold and can make more things happen with limited playmakers. The defense is led by second year safeties Jamal Adams and Marcus Maye, and they will continue to flourish. Leonard Williams gets a bad rap locally, and I think he is one of the better nose tackles in the league. Todd Bowles is a good coach and is a victim of early success with a team that wasn’t that good. Expect the Jets to be very competitive this year. Despite breaking their 18 year playoff drought last season, the Bills decided to move on from Tyrod Taylor at quarterback. While this move has potential to pay off in the future, Buffalo should take a step back this season. Career backup A.J. McCarron will likely start at quarterback until first round pick Josh Allen is ready to take the reigns. Allen is still raw, so I don’t expect him to be ready to contribute at a level conducive to winning this season (though I’m sure he will see time). Tyrod Taylor may not have been spectacular but still better than McCarron, so their quarterback play will dip a little. Let’s see how much LeSean McCoy has left to offer. I don’t see much offensively with this team (and they weren’t all that explosive last season). Defensively they should be good. Kyle Williams is still productive at defensive tackle and Star Lotuelei will team with him nicely. Micah Hyde is a solid safety making them strong up the middle, and we will see if Vontae Davis can get back to being a quality corner to go with Tre’Davious White. Offensively, they just don’t have enough to get over the hump though. Head Coach Adam Gase obviously wants to make a culture change. In doing so, however, he has simply let too much talent walk out the door. Jarvis Landry, Ndamukong Suh, and Mike Pouncey were all good players at their positions and are now gone. Ryan Tannehill will be coming off injury and has a lot to prove in my opinion. They are solid at tackle with Laremy Tunsil and Ju’Wuan James, and Josh Sitton is a nice addition at guard. Kenyan Drake can play, and he will need to be explosive for this offense to be productive. Cameron Wake is still a quality pro rushing the passer, and Xavier Howard is their best cornerback, but I don’t see much on the defensive side of the ball outside of them. The culture will be different, but the wins will not for the Dolphins.